Beautiful Sunday and Sublime Sunday - Time Out With Friends !! For the past week i have not been so active on steemit due to my stepson visiting me in Bangkok for his 30th birthday so i had arranged to take time of work and spent some time with my stepson and his friends none of them had been to Thailand before so it was a pleasure to be with them and show them around. We had decided we would go to Pattaya city which is about 2 hours south of Bangkok it's a very lively city with lots of little islands close by so we booked at the Base Apartment 42 levels high and these were the views from our rooms and the rooftop. After settling in to our 5 star apartment early Sunday morning we had decided we would go to one of the white sandy beaches most of these little islands are about all one hour away on the slow ferry boat but we decided to take the speed boat which only takes half the time. The speed boat is the way to go if you are in a group the cost is $10 per person more private and more fun and they will take you to any island you like in less then half hour you are there and they will come back and pick you up all included in that price. There are actually a few more little island around the Pattaya area with all white sandy and crystal clear waters but we decided to go to Kon Larn only because i had been there before and knew that it would be suited for all of us. Koh Larn is just off Pattaya mainland in the Gulf of Thailand , also known as Coral Island , measuring four kilometers long and two kilometers wide the beach has very clear waters with a hilly forested mountains. 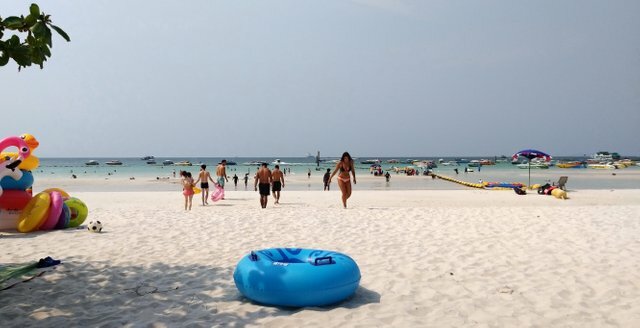 Koh Larn is the most popular day trip island they have beach chairs for rent at all of its main beaches which will cost you $3 US and have several restaurants serving seafood as well as Thai and international dishes. Besides swimming, sun bathing and relaxing on the beach, visitors can ride a jet ski or banana boat, go snorkeling or kayaking or take a hiking trip in the islands forested interior. If you decided you wanted to stay longer on this island there are hotels and bungalows at several beaches at very reasonable rates from $20 to $60 US depending on the size of rooms you wanted. The sunsets and sunrise are absolutely breathtaking on this island. Our day was coming to a end on this little beautiful paradise island our speed boat was due to pick us up at any moment now to take us back to Pattaya city it had certainly been a enjoyable day relaxing , swimming and eating and hopefully we will be back to this paradise some day soon again. And in a matter of no time we were back on the mainland was a great day and it was back to our apartment and get ready for my stepson's big 30th birthday party night with friends. Thank you @ace108 for hosting #beautifulsunday and thank you @c0ff33a for hosting #SublimeSunday. Wow! How nice to be by the sea! Having seafood and party too! I've never been to Pattaya. The view from up there looks great but I guess the trip must be completed with a walk by the beach. Howdy sir hangin! those are a marvelous group of pictures there which gives us a real feel of the beach and area, wonderful job and it looked like you all had a great time! What an amazing time you spent with family, fabulous photographs and so many as always - you really went to town with them! Loving the colourful speedboats especially.